Bereaved families in Shropshire are being urged to act quickly to settle the financial affairs of a deceased relative due to a planned huge hike in administration costs. The government has just announced that a large increase to probate fees is likely to be introduced from May 2017. County law firm Wace Morgan was one of the many businesses who objected to the government’s proposals when announced last year. 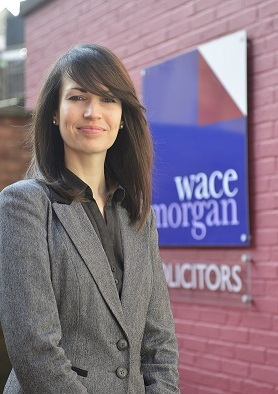 “We expressed our concern at the plans during the consultation period but the rise is going ahead anyway and we think it will cause financial hardship for many local families,“ said solicitor Emma Jacobs of the private client team at Wace Morgan’s Shrewsbury office. There is currently no fee for applying for a grant of representation, which gives you the legal right to administer a deceased person’s estate, if the estate is worth less than £5,000. Over £5,000, if a personal representative is applying for the grant then the court fee is £215 and if applying through a solicitor it is £155. From May, the applicable court fees will be calculated on the value of the deceased’s estate. The new bands will see a hike of 40% to £300 for estates worth £50,000 to £300,000 and escalating to £20,000 for estates worth £2m plus – a 9,200% increase. These fees are payable in addition to any inheritance tax due and must be paid before the grant of representation is issued. “The new probate fees will also create problems where estates predominantly consist of assets, such as property or farms, as there may not be enough cash available to pay the fee, leading to expensive bridging loans, additional administration costs and delay. “A very small number of families – where the estate is less than £50,000 but more than £5,000 – will benefit as they will now not have to pay a fee at all but the changes will have a major financial impact on a large number of bereaved families. The government says this money will be a ‘critical contribution to cutting the deficit and reducing the burden on the taxpayer of running the courts and tribunals’.